Hurghada International Airport is an aerial gateway to city of Hurghada in Egypt. Situated at a driving distance of 5 kilometers (3 miles) of the downtown region of Hurghada called El Dahar, Hurghada International Airport is a busy airport with one terminal equipped with all the main airport facilities like currency exchange, banking, souvenir shops and other duty free stores, as well as restaurants and bar section. Hurghada International Airport serves national and international airlines like Condor, Air Berlin, Hamburg International, TUIfly and more. 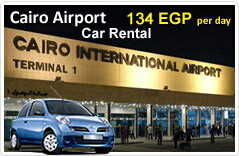 This airport also supports all the reliable car hire and rental services. Hurghada International Airport is a gateway to the resort city Hurghada and supports affordable car hire facilities, among its ground transportation. Book a car in Hurghada to drive to Sekalla, El Memsgha and Donwton El Dahar. Hurghada has many water activities for followers of adventures like scuba diving, snorkeling and windsurfing. Hurghada city is visited by both vacationers and business travelers arriving at Egyptian cities like Cairo and Luxor. Hurghada has a mouth watering cuisine to offer which includes oriental, fast food, continental, Thai and more. Rent a car to drive to a local restaurant to cherish Hurgahda's gastronomical delicacies. Booking a car for Hurghada airport in Egypt from Egypt Cars Rental and enjoy an impressive flotilla of cars to select your vehicle from. Our budget deals includes car from Nissan, Ford, Toyoto and Honda. We understand that renting a car in a foreign country needs assurances, thus we support you with facilities like insurance, theft protection, collision damage waiver and breakdown assistance. When looking forward to easy commuting from Hurghada airport to anywhere in the city, book a car fromEgypt Car Rental to earn yourself a self driven vehicle on rent.